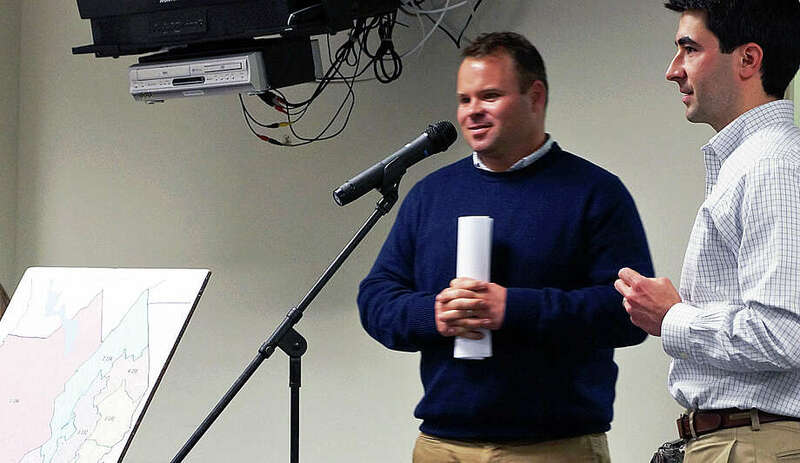 Representative Town Meeting members Chris Tymniak, left, and Phil Pires present a new map for local voting districts to the full legislative body Monday. A new plan to re-draw local voting districts came before the Representative Town Meeting Monday, but discussion by members of the legislative body centered mainly on who could make amendments to the proposal by the four-member Redistricting Committee. The full RTM did not vote on the new voting map, and it now appears that the earliest it will come up for a vote will be January. The plan also would reduce the number of representatives in each district from the current five to four. .
Michael Herley, R-1, pressed Town Attorney Stanton Lesser on who could make amendments to the proposed map. "I thought this was the time to make amendments," he said, and then the full RTM would recess so the Redistricting Committee could act on those amendments. "Any proposed amendments must come from the committee," Lesser said. He said the RTM could make suggestions, "but they don't have to listen to you. It's up to the committee." Pires and fellow committee member Chris Tymniak said the panel is more than willing to listen to suggested amendments. Committee members would prefer, Tymniak said, for others to forward suggestions to their respective majority and minority leaders and "We'll take the package and bring it back to the committee and take a committee vote. This is the map we delivered. We are open to hearing suggestions on how to make it better." Tymniak said the Engineering Department is still working on a detailed description of the map boundaries, and that likely will not be ready until the December meeting, pushing a vote off until at least January. Pam Iacono, the RTM's new moderator, said in order to have the new districts in place for possible primaries in 2015, the latest the RTM could vote would April. A committee last year deadlocked on revised boundaries for voting districts based on new census data, and its three GOP members subsequently brought a proposal for an eight-district map to the full RTM. Though that plan was approved by the RTM along party lines, it was invalidated by a court ruling for not following the town's regulations on re-drawing district lines. "Last time, we didn't get to this point," RTM member Jeffrey Steele said. Steele was moderator when the earlier Redistricting Committee began its work in 2012. He asked Lesser why the redistricting ordinance is handled differently than other ordinances. "The charter says the resolution shall be proposed by this committee," Lesser said. "This ordinance cannot be amended on the floor." "That's your interpretation," Steele said. Although the new map was sent to RTM members in September, Ellen Jacob, R-9, said, "most of us are seeing this for the first time this last week" and the new map contains "some big changes." She also suggested that perhaps it should go back to five representatives per district, rather than the proposed four members. Reducing the size of the RTM from 50 members was a sticking point of the original committee, with the GOP advocating for the 40-member body. "The maps were mailed out last month," Tymniak said, in response to Jacob, to allow for a discussion this month and a discussion and vote in December, "so it's really three months before we would take action."